Belonging to Czech Republic, the Prague Ratter is a tiny breed of dog. It is seldom seen outside its country of origin. By breed standard, it is the smallest breed in the world. This is with reference to the height of the dogs, i.e it is the smallest dog height wise. It is a very old breed and hence tracing its early beginnings is not only difficult but is in fact impossible. However, Polish chronicler Gala Anonym claims that Polish Boleslav II The Brace (1058-1080_ was a proud owner of two Prague Ratters that came from Bohemia. It used to grace royal banquets and was also a symbol of independence of Czech lands and sovereignty of the Czech nation. The Prague Ratter beautified the courts of Czech princes and kings and was presented to other European rulers as gifts. From the royal palaces, they were passed on to the other affluent members of the society and eventually to the ordinary citizens who used them as rat catchers. 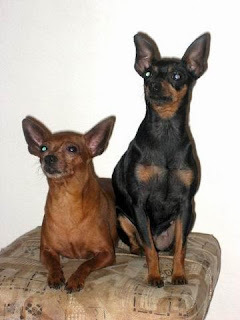 In the 19th century it started to lose appreciation and Miniature Pinscher took over. However in 1980s Czechs and Solvaks started breeding them again. The natural color and most common color of this breed is black and tan but lately other colors have also been approved which include Brown and tan, Red and Merle, Blue and tan, Lila and tan, and Yellow. The coat of the dog consists of short, glossy hair. The best weight of the dog is 2.6 kg but it is usually between 1.5 kg to 3.5 kg and the ideal height of an adult Prague Ratter is 20-23cm. They are a lively gentle and brainy breed who are suspicious of strangers but are very devoted to their family. Despite its small size, it is very useful for agility, freestyle, obedience, tracking etc. Due to their highly developed sense of smell, the prague ratter is a great rat hunter and will also go after squirrels, mice and raccoons. It is generally a very healthy dog breed living up to 12 to 14 years but sometimes is subjected to bone injuries because of their size. Moreover they can have retained baby teeth which need to be pulled in order to prevent problems. Moreover, it also suffers from patellar luxation just like other small breeds.